named ERG (see fig. 1). The system is a closed system: the cold air comes out (forced by fans) from the front side of the cooling module:then is sucked in UPS & servers by fans. The hot air comes out from the rear part of UPS and servers, and is sucked in the cooling system. A special membrane parts the hot from the cold air. The fans in the cooling unit are redundant and with variable speed, to optimize the energy consumption, and can quickly be replaced without stopping the system. 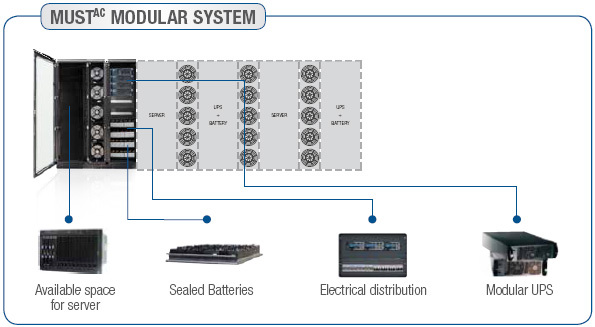 The system is supplied by modular, redundant (N+1) UPS on line, which provides for continuity of power supply (perfect sinusoidal waveform, noise free). The inner sealed batteries provide the energy reserve in case of blackout of the mains. 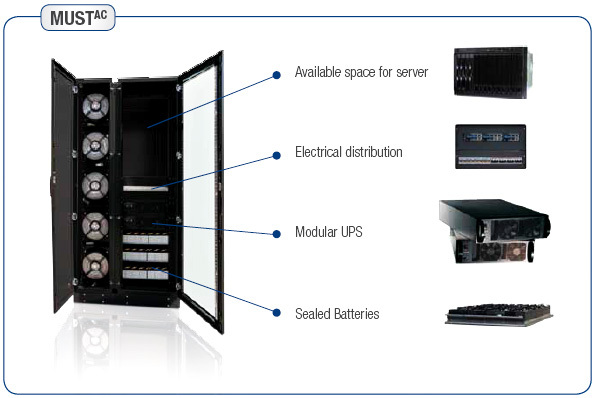 MUSTAC is a modular system that can be built in different configurations, depending on the needs of the Data Center. 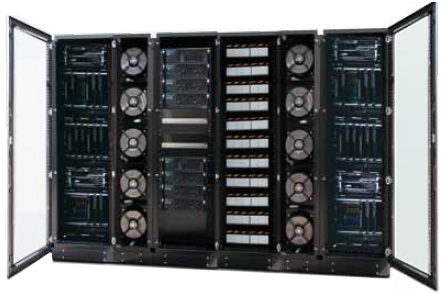 Its special feature is the possibility to be be adapted to the Data Center power and dimensions. Moreover it can grow with the Data Center starting from a basic standard configuration optmizing in this way the investiment costs to the real needs. Basically two different cabinets are available. Cabinet CSW or CSG. These are the cooling cabinets and they can work with chilled water or refrigerant gas in connection with the external units. They are combined in the modular system to cool the apparatus for server and power UPS. Their number depends on the installed power. Cabinet SU. 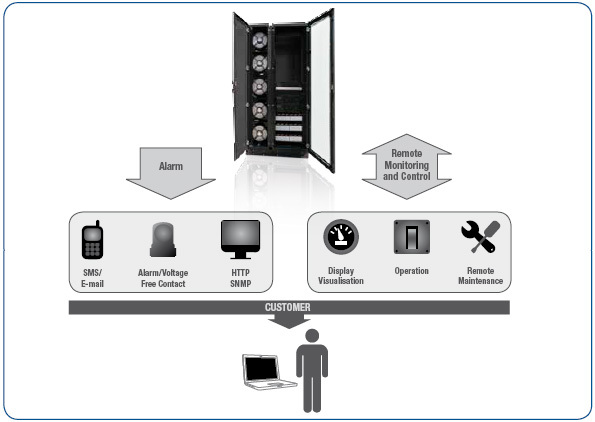 This type of cabinet can include the server or the battery or the UPS or a combination of them. As from the figure below, it is possible to expand the system combining the two different cabinets depending on the Data Center requests. 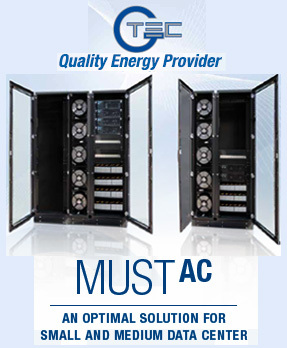 The MUSTAC smallest configuration includes two cabinets: one cabinet SU for the UPS, battery, and server, and the other cabinet for cooling type CSW or CSG. 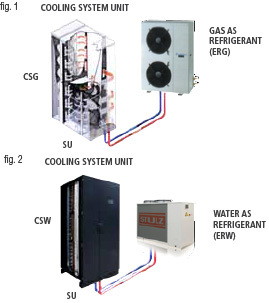 Below is a typical configuration with two cabinets CSW, two cabinets SU for server appartus and two cabinets SU for UPS and Battery. 16 ports, keyboard and touchpad. The Keypad Module is the processing unit of the Stand-alone electronic locking system. It includes a numerical keypad as well as the data memory and the controller unit for the storage and evaluation of the input. It is possible to connect up to two handles that will be controlled by one master handle.